The movie pitch originated online after a photo of the duo went viral. Rihanna and Lupita Nyong'o are set to co-star in a Netflix movie based on a viral meme. A photo of the 'Needed Me' star and the award-winning actress sitting front row at a fashion show in 2014 resurfaced on Twitter last year, prompting one user to demand the pair star in a film together. Well, according to Entertainment Weekly, it's actually happening. Netflix are reportedly behind the upcoming project after a "dramatic negotiation session at the Cannes Film Festival". The movie will be directed by Ava DuVernay, whilst Issa Rae is set to write the screenplay after Twitter suggested that the duo mastermind the movie. Netflix allegedly beat out a number of competitors in a "very aggressive bid" to nab the film - the concept of which was initially born on Tumblr two years ago. 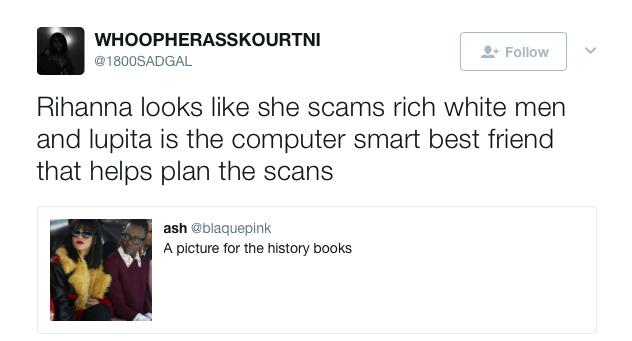 One user captioned the photo: “They look like they’re in a heist movie with Rihanna as the tough-as-nails leader/master thief and Lupita as the genius computer hacker." This was followed up earlier this year by Twitter user 1800SADGAL, who suggested Rihanna play a crafty scammer whilst Nyong'o portrays her intelligent counterpart. Social media was left buzzing after both Ri and Lupita agreed to take part the movie, before DuVernay and Rae also tweeted their approval. The project is allegedly in the early stages and will potentially begin production in 2018. Rihanna and Nyong’o are yet to respond to the reports.